Shopping for Guardians of the Galaxy Nesting Dolls? 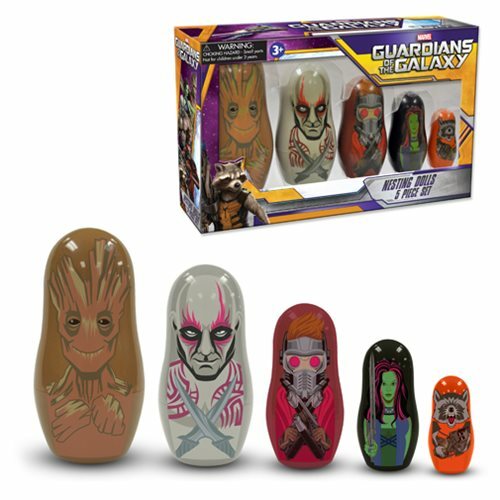 Get the entire team with Marvel's Guardians of the Galaxy Film Version Nesting Dolls! The complete set of 5 plastic nesting dolls brings you Rocket Raccoon, Gamora, Star-Lord, and Drax all nestled inside the lovable giant grinning Groot. These colorful and dynamic nesting dolls range in size from 2- to - 4 1/2-inches tall. The limited edition set is perfect for learning as you play, and they look awesome on display. Get them for your desk - or toy box - today! Ages 3 and up.